Is There Room for Music on the Playground? Music has been with us since the earliest civilizations. There is reason to believe that every culture throughout history embraced some kind of music, just as we can safely bet children have been playing since the earliest days. Music is called the “universal language” for a reason. It can be a uniting force for people, and children are no exception. No Fault Sport Group’s blogs are usually about playground design and trends in safety surfacing. We are also interested in new studies on childhood development and find it fascinating how modern playground architects and equipment suppliers are incorporating music performance and education on the playground. More than outdoor singalongs or instrumental lessons happening in the park instead of indoors, we are referencing built-in musical features that become part of a playground’s design, meant to be played with as much as everything else in a playscape for toddlers and grade-school children. 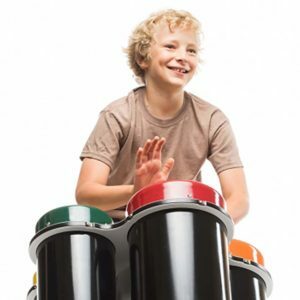 Little Tikes supplies a musical line called “Concerto” that incorporates drums and xylophones. Miracle Recreation also has a “Concerto” musical line of equipment. Playworld has a product called “Rhythm Spinner”. 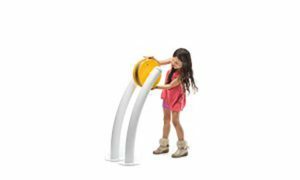 Children can spin the dial to hear cool music, reverse directions to change the song, and hit the drum pads to play along with the music. Landscape Structures also incorporates musical products in their play equipment with the “Rhapsody Line”. Playground-friendly musical features (like the ones listed above) are made to withstand the heavy impact that tiny “Beethovens” seem capable of heaping upon them. They are also built to last through years of exposure to sun and rain (not to mention strawberry jam-smeared fingers). Playgrounds, for the most part, are all about giving children an opportunity to work off the boundless resources of energy they seem to have. They are also a place for children to grow mentally; having musical features in play areas enhances sensory play and aids in this growth. For example, when children play music together, they are learning to work together as a team and develop their sense of empathy. They are learning ways to express themselves. Sure the “music” being made may not sound perfectly harmonious to the moms and dads listening nearby, but young children start to understand basic emotions and how to express them constructively by using expression through music. That does not mean they will not continue to cry, throw temper tantrums, or have meltdowns from time-to-time – they are children after all. However, there is no denying that children who have been introduced to music performance demonstrate enhanced communication and reasoning skills as they age. According to a recent article in Playground Professionals, “music and play are very effective ways for children to learn about and explore feelings, and then practice how to express and manage them.” We agree, and this article is one of many we have read that says music education helps children develop social skills, emotional skills, and more. Everyone likes playing music! 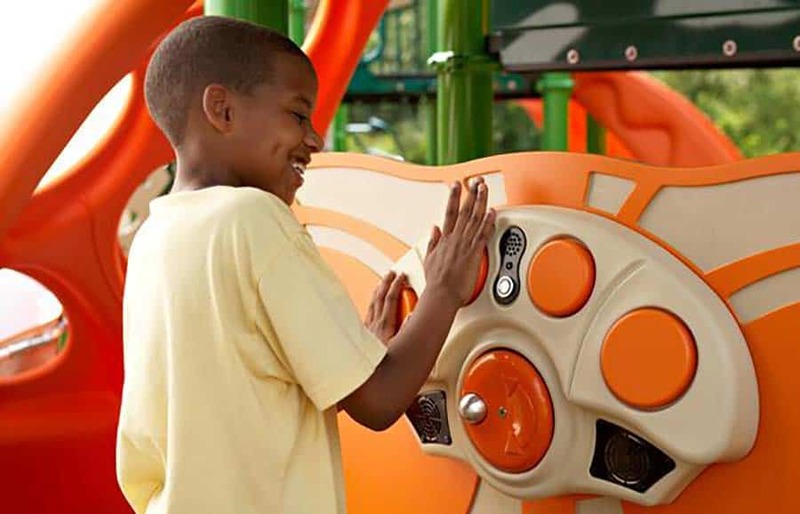 As inclusivity is increasingly becoming a major goal for today’s playground designers, music is a great way to incorporate playground aspects for children of all ages and abilities. Music has been used as therapy for children who do not communicate well with others. As for children with developmental disabilities, such as autism and Asperger’s syndrome, this kind of music therapy can be an engaging way to help develop their social skills. You’ve heard about “left brain” and “right brain” thinking, right? Playing musical instruments engages the entire brain, stimulating both the analytical and the artistic halves. One characteristic of autistic children is that the left and right hemispheres are often “out of sync.” Playing a musical instrument can make new neural connections for these children. Sometimes, the effects can be profound. Plus, it makes them happy in a way other activities simply can’t! No Fault Sport Group partners with equipment suppliers and playground designers across the country. We specialize in safety surfacing materials such as our poured-in-place rubber surfacing and synthetic play turf, but we may be able to steer you in the right direction if you’re looking for unique playground features like musical instruments and percussive features. Contact us today, and we’ll talk about your vision and your goals!